O’REILLY is the technical publishing house which has published many books on cutting edge technologies. All the books on popular software, software tools, computer principles, Electronic Commerce are being published by O’Reilly. Safari Books Online is an On-demand digital library by O’Reilly which lets you search over thousands of reference books quickly. Apart from this one more initiative by the O’Reilly makes it different from other publishing houses. Recently had ordered the book Using Joomla from Flipkart and it was shipped to my address within time. The cover page of the book was impressive as it has some bird sketch on it. I thought it may be the other way of attracting people towards books. After going through the book page by page, breaking head for developing a simple content management system using Joomla (as I was trying it for the first time) I was quite confident enough to install and use Joomla. I was flipping through the pages of book, found the name Colophon and read the content below that name. Then I came to know it is the description of image or sketch of bird found on cover page, felt happy to know about the bird, its diet and its breeding etc., Also felt bad to know about its sharp decrease in population. 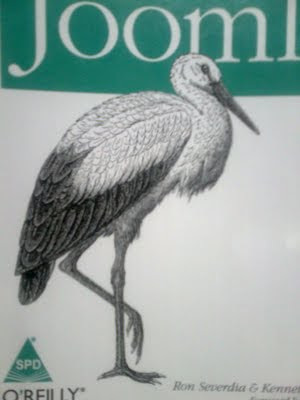 I was curious and looked at the other books published by O’Reilly, most of its books had bird sketch on cover page and its description inside book. It is a very nice idea to educate people about birds. Really a good initiative by O’Reilly, hope other publishers will also get inspired by this and provide some useful information on the cover pages. All of you know passing away of ‘Self – declared God’ Sathya Sai Baba. Whatever people may tell about his divine powers or mystical powers, no body can comment on enormous work he has done. No one qualifies to comment on educational awareness he has created among rural people. Anyone who has seen ‘Puttaparthi’ will definitely wonder how a rural village boy transformed it into the land of modern hi-tech facilities which includes free health treatment to even poor people at ‘Sathya Sai institute of higher medical sciences’. I don’t know anything about his divine power or he is an avatar of God, I know only about his work for the betterment of mankind. 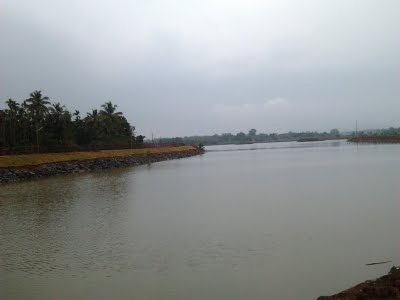 Drought hit areas near Puttaparthi are having good water facilities. People of Puttaparthi have found their own ways of living through self – employment because of people visiting Puttaparthi everyday. Starting of educational institutions in rural places of Karnataka such as Alike and Chokkadi in South Canara and Muddhenahalli near Bangalore has created an opportunity for rural students to study in these institutions. These institutions are providing quality education, not only education every care will be taken such that students will imbibe moral and ethical values along with conventional education. Thousands of children who are educated in these institutions are in top – positions of various public sector companies and high profile jobs. Not only education, in every aspect Sathya Sai Baba has contributed, free health treatment to the poorest of poor people is given through Sathya Sai Baba super specialty hospitals. Some of you might have come across Satya Sai hospitals at Bangalore and Puttaparthi which are giving treatment to people free of cost without any discrimination. ‘Prashanthi Nilayam’ which has got status of Deemed University is imparting quality education to students taking just nominal fees. You may be astonished to know that the fee of entrance exam of ‘Prashanthi Nilayam’ is just Rs 100 where as it is Rs 1000 in any of the other deemed universities. Sathya Sai Baba has preached the same principles which our Vedas have in it, that is love each other, be honest and do good work. These are just the indicative instances, there are many other works and trusts which are started under guidance of Sathya Sai Baba are doing very well. You can look into any website or ask anyone about Sathya Sai Baba, everyone speaks about good work he has done. He has done ‘miracles’ through his work which any one else or government find difficult to do. I always hate to read lengthy textual content and find it irritating to read whole lot of sentences and understand it. If the text matter is of simple words or contains simple sentences, I can read couple of pages but if the content or text matter is with usage of complex words and sentences. I just hate to read such contents. If any popular or best seller book is available in market, first I will search reviews about the book on the internet, what the book is all about, what it contains and its description then only I will proceed to purchase or even I will try to find whether anyone has translated the book. Hope at least by now some of might remember having difficulty in reading any book or best seller written by some popular author. On the other side, if the same content of the book is expressed in an image, we won’t have difficulty in understanding things better and accurate. It is always easy to explain anything to anyone with the help of image rather than breaking head in explaining it just with words let it be house blue print or world map. One more thing I observed is we can recollect things from an image better than textual content. If you are planning to remember something or preparing for any examination make sure that you will try to figure out the concept you understand i.e. express whatever you understood in the form of an image. Draw a free hand sketch including important observations or points you made while reading such that if you just look at the image you should be able to recollect whatever you have read in the form of text. If your kids or anyone is finding it difficult to understand any concept or subject or failing to recollect something, teach them the way of understanding or recollecting with the help of an image because images will always speak better than textual content. Summer schools or summer camps have become very popular in the last few years. It has almost become a trend that each and every school makes it compulsory for their students to attend. In the name of summer camps schools like to make handsome income apart from the regular yearly school fees. If students are not willing to attend, school stick the summer school name with scoring good marks in board exams and start to teach subjects from the beginning of summer camp so that students can excel well in the board exams. Recently I saw a new banner in which they have carefully made statement that they will help in career building and personality development of students. I do not know whether students who attend will make use of what they have paid or not, but schools will fully utilize money collected in name of camps or schools. Summer camps were started with an aim to develop extra curricular skills among kids and children so that the young minds will relax without regular exams or home works. Usually classes would be of learning swimming, painting, horse riding, photography, bird identifications, astrophysics combined with star gazing activities in night etc., but now everything has vanished and summer schools have become money making business. Whatever may be the reason or justification summer schools give, the main agenda is to make money out of it. I we look at outer world, we will find numerous schools and colleges which teaches students indirectly that making money is the main aim in life rather than developing thirst for knowledge. What can be done in summer vacations which will be of beneficial to our children. In vacations, plan properly so that children can enjoy maximum as far as possible. They will be stresses out of regular exams, competitions and home work through out the year, again don’t let them in the same pool. Engage them in extra curricular activities like gardening or culturing plants in the pot. Always develop activities that encourage children to develop love or liking towards nature. Always love with the nature is the best way for children’s mind to nourish and best learning is always from nature. Our children are not knowing human values like sympathy, love towards fellow children, kindness etc., All have developed to see others as competitors or enemies rather than universal brotherhood or world is like a whole large family. Try to remove the feelings of hatred, jealously kind of negative thoughts from their mind. If the children are not taught with our own heritage and culture, years are not so far that we will be sent to old age homes, where old people will be admitted to taken care of by our own children. Everybody will teach about making money but no body speaks about imbibing values and culture in children. Tell them stories of great epics such as Ramayana and Mahabharata. Don’t forget that children of today will be the citizens of tomorrow. Please try to make mother Earth a heavenly place for tomorrow, it is our responsibility. India’s science and technological development took its own time to develop and cherish to what it is present today. Hundreds or may be thousands have dedicated their sincere service for the development. Among many places in India where Indian Science architects were present, Indian Institute of Science (IISc), Bangalore stands top on the list. It has the reputation of having Noble Laureate Sir C V Raman as its director. In this blog I will write about a woman who was the first woman faculty member at the Indian Institute of Science, who was even the First Woman Engineer of India, Late Professor Rajeshwari Chatterjee. Madam Rajeshwari was born on January 24, 1922 in a prestigious educated family of Nanjanagud near Mysore, Karnataka. Those were the days during which giving education to girl child was rare and young girls were tied knots even before knowing what the meaning of husband or life is. But Madam Rajeshwari was lucky, as she was from an educated family. She completed her graduation and post- graduation in Mathematics and Physics from Mysore University in 1942 securing First Rank. Being a post graduate she attended interview at IISc for project fellowship. There was a huge discussion and debate in accepting her, as she was the first woman candidate to attend interview. After a little hesitation, Sir C V Raman, being its director agreed and accepted her for the post of project fellow. It was the period of Pre-Independence. After Indian Independence, Government of India invited applications for scholarships to pursue higher studies in aboard, with a condition to serve the country for three years after completing education. Madam Rajeshwari got the scholarship and went to University of Michigan, Ann Arbor, USA to do her Master’s in Electrical Engineering and also did her Ph. D from the same university in 1954. She came back and joined IISc as faculty in Electrical Engineering. She was the first woman to be on the faculty of Indian Institute of Science. Being on the faculty of IISc, she has guided 20 Ph D students, who are in top positions of many research institutions. Apart from this she has published seven technical books related to Antennas, Microwave Engineering. She was married to Dr Sisir Kumar Chatterjee who was also a respected professor at the Electrical Engineering department of IISc. Having spent much of her time at IISc she finally retired as Professor and Chairman of Electrical Engineering Department in the year 1982. Madam Chatterjee was respected by her colleagues and students. Students were used to approach her for even suggestion for their personal problems. One more non-technical book to her credit is ‘A thousand Streams: A Personal History’ which has anecdotes of her life starting from her childhood to present which includes conditions of Pre and Post Independent India, her journey to USA all alone and status of women in society. The book is the reflection of intellectual brilliance and phenomenal memory of this great woman. A must read rare book which documents the situation of past by experiencing it. After living a dignified and content full life Madam Chatterjee passed away on 3rd September 2010. On a personal note, ‘Women in Engineering’ international conference was organized by IEEE at Bangalore in 2009, I was fortunate to attend as it was organized at the college which I was studying. In the same conference many who had done little work or contributed little to the field of Engineering were honored but no body were aware or known about Dr Rajeshwari Chatterjee, who had honor of being the first woman on the faculty of Indian Institute of Science. If you are planning to start any online business or develop website which will have contents updating frequently, you can go for website development using Joomla. It is helpful for the end-users who own the website with little technical knowledge to easily manage the content of website without contacting to the actual developer for simple changes on the website. To know which of the popular websites uses Joomla content management system you can just add ‘administrator’ at the end of the website domain name. Suppose you want to know about website www..com just suffix administrator at the end of domain name(www..com)/administrator) You will be directed to Login page which confirms that the website uses Joomla. Suppose the folder is password protected, then also you will get a message ‘password protected’ or ‘password protected folder’, which confirms that the website uses Joomla. Making money from share market is the much attracting slogan you see everywhere on internet, news paper, TV and sometimes on your mobile phone. Is it so easy to make money from share market? Don't invest in share market if you are a starter or you are planning to invest based on anyone's suggestion. Finally you are the one who is going to be in loss whether you listen to anyone or to any share broker. There is no shortcut in making money. Similarly in share market also if you buy good company share and keep it for long time, that will fetch good returns. Do not be panic, believe and invest in good companies. Surely you will be benefited. Be careful and invest keeping in mind above techniques and also experience teaches you a lot. Learn from experience once you start investing. Results of GATE, CAT, MAT and XAT exams are out. In another month or so all the Post – Graduate Engineering or PG degree colleges (MBA or PGDM) invites applications for the admissions. At the same time many institutes in India are not recognized by All India Council for Technical Education (AICTE) or University Grants Commission (UGC) but claim that they have recognition. It will be very difficult to tell which institutes are having recognition and which are not having recognition. In view to help people to identify Fake institutions this blog is written. If the university is recognized by the UGC then the name of the university will be listed in the list of recognized universities on the UGC website and it will be updated frequently. There are three kinds of Universities are permitted in India by the Central Government namely Central Universities, State Universities and Deemed Universities. Central Universities will be directly established by UGC by the act of Central Government, State Universities will be established under State Laws of respective State Government and will be running under the guidelines of UGC and Deemed Universities will be established by taking permission from the UGC and will be having there own curriculum and the degree will be awarded by the Deemed University itself. Even the name of colleges affiliated to the universities is also provided in the UGC, refer to all sites before you take a seat in any professional college. There are many fake institutions as many as good institutions. Some of the institutions are started by the Central Government in order to promote science and technology namely International Institute of Information Technology and International Institute of Information Technology Design and Manufacturing etc., which are situated at Hyderabad, Bangalore, Bhubaneswar, Jabalpur, Kanchipuram are examples of it. Respective links are given, one can go through these links before taking admissions. Recently AICTE has also given the list of recognized Engineering colleges and the courses which are running in it. Search about college or take advice from the seniors before taking up of admissions in any institute whether it is recognized or not. Education is the right of everyone but having it in proper place also matters. Anything which is present on this Earth should obey the laws of nature if not; the existence of such units will be very unlikely. You might have seen all living organisms will undergo or will obey the rules of nature even at the minute level of cells. If there is any violation in these rules by the cells or the organisms, it will be against the nature of cells and nature will act on destruction of such organisms. Any object or anything which is present parallel to the surface of the Earth at a certain height will undergo physical stress because of Earth’s gravitational force. In simple, if a stick is parallel to the surface of earth at a certain height will undergo physical stress by the Gravitational pull of Earth. If the balance is provided at one end to the stick, then the other end will undergo stress by the Gravitational pull and if the balance is provided at the center of the stick, then the stress will be there at the both ends of stick. If again some balance or strength is given against the Earth’s gravitational pull at the places of stress then the stick will undergo two kinds of forces, one is the stress which stick is undergoing because of Earth’s gravitational pull and the other is the force acted by the balance or strength on the stick against gravitational force. Now the stress will be transferred to the other area of the stick. The stress is negligible if the stick is thin, but it will be considerable more if the stick is considerably thick. This is the story of non-living things. What may be the case in living organisms? Living organisms will also have a similar stress. In case of obsessed belly, the outer portion of the Belly is gently held if you are wearing pant or saree or any dress. If you are wearing tight pant or any dress tightly then also belly will have two kinds of stresses acting on Belly as explained above. This causes accumulation of cells at a single region leading to many diseases. Similarly in case of Breast or mammary glands in human beings, female mammary glands will be developed sufficiently to feed milk when a female gives birth to a child. The breast will also undergo same kind of stress effect by the Earth’s gravitational pull. If breast is tightly held by Bra then two kinds of forces will be acting on Breast, one is by the Earth’s gravitational pull and the other by the Bra against the Gravitational pull. It means Bra is holding the breast against the Gravitational force. These two kinds of forces acting on breast causes accumulation of cells or any wastes leads to formation of Cancer cells. In earlier days there was no report of cancer cells in breast as there was no forces acting against the Earth’s gravitational pull. But now it is observed in the Breast, this may be the clear effect of wearing tight bras. The above theory is just the observation and needs sufficient support to prove this. Even wearing Bra may be the reason for Cancer causing cells, Chimpanzees and Gorillas also have similar anatomy as of human beings but there are no reported case of Breast cancer in them. May be am not aware of it. This is just the possibility or the hypothesis, anybody who is from medical back ground or working on these kinds of problems should give answer as am no where related to the medical field. Being outside the home from the last six years made me not to involve directly in the day to day life at native where my parents are staying. During my stay at home (I told about it in the older blog) slowly understanding present situation which has changed significantly over the few years. Father being retired from the service not yet settled with the pension benefits and the house is running on the salary of my mother. Don’t know what is the reason why my father’s pension is not settled? He is keep on telling that all are asking bribe in the office and related files of pension settlements are not at all being processed. We never asked anything about it in detail thinking he may feel bad. Mother was casually speaking about making pickles and going to the marriage of cousin which is scheduled in the month of May as she is having vacation now. At the same time Milk Man came to give us milk, he usually comes late night after 10’o clock. My father told him lies that day before yesterday’s milk got spoiled because you come late and all similar things. After Milk Man’s departure Mother asked dad why did you lie? I don’t understand why my father got angry and started shouting at my mother for mentioning about Milk Man. He told he is getting all troubles in life because of my mother and she will be pointing out or commenting out mistake in whatever he does. In anger he told Mobile phone on ground, which shattered into pieces. My mother was spell bound and didn’t speak a single word. Being a respectable teacher for nearly twenty years till today she teaches till today and show love towards children as their own kids. Tears rolled on her cheeks without a single word. I didn’t speak anything to my dad or mother regarding whatever my dad did or spoke; I simply sat in the corner of the room thinking why the situation has become like this? My mother being a caring wife, mother and a teacher, perfectly balancing all the three caps. My memories just rolled back to the days when my mother used to take care of me and my brother all alone when my father was away doing a job in a far away town. My mother have done everything to keep us happy, in turn me being at home couldn't do anything instead of keeping my mouth shut helplessly, my eyes were moist and couldn’t dare to look at her. 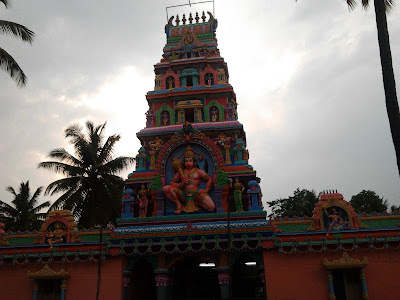 One of the attracting and more people visiting place at Shikaripura is the Hucharaya (Hu-Cha-raya) Swamy Temple situated at the outskirts of Shikaripura town on Honnali (Ho-NAa-li) road. The temple is also called Bhrantesha (Bhran-Tesh-Aa) temple. Every year Car festival of the temple is celebrated on the day of Dhavanada (Dha-vana-da) hunnime (hun-ni-may) or Hanuma Jayanthi grandly followed by the Theppothsava (Tep-poth-sava) with burning of crackers. There is estimation that nearly three lakh people visit the temple every year during the festival. Government of Karnataka has granted sufficient funds to renovate temple. 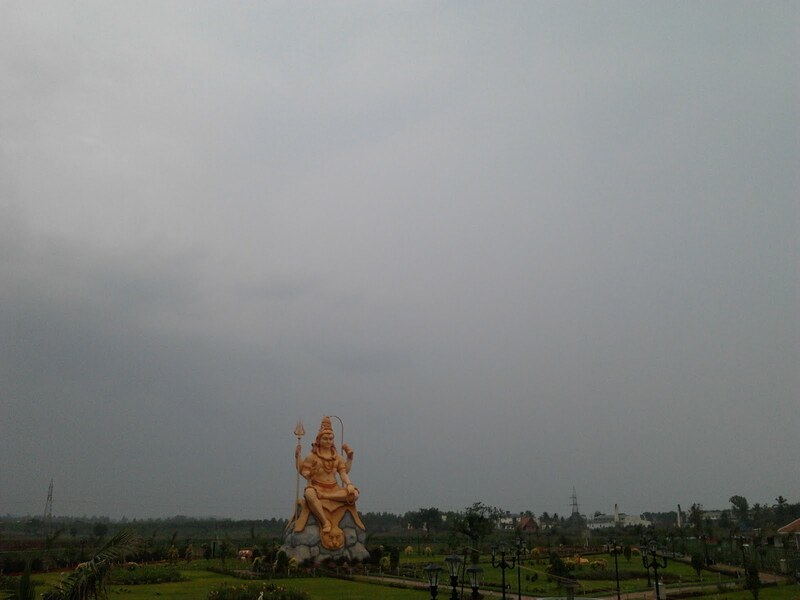 Entrance of the temple is newly built and old temple building is renovated. Temple is also having an interesting history of many hundred years, but the sad thing is none of the published books or guides are available to give information on history of temple. 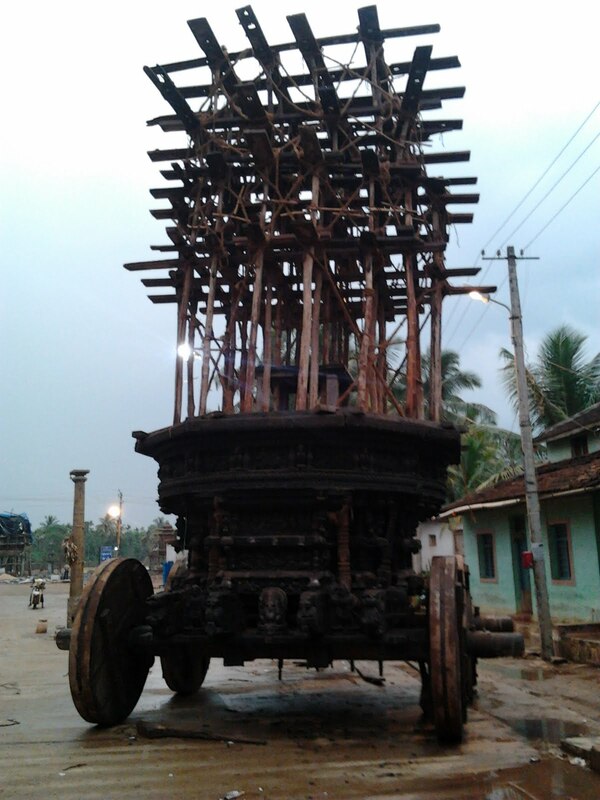 Temple also has Cars which will be puled on the day of festival one smaller and the other one bigger. One more astonishing fact is every year when the Car is pulled out of the room for the purpose of decorating for festival, there will be definite rainfall. 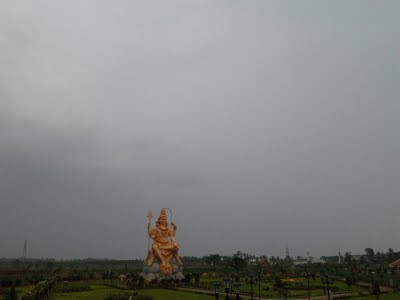 Also, recently Government has taken up project to develop garden on the banks of Lake, construction of 42-foot Shiva idol in the garden adds beauty to it. Children of cities today get so many resources for entertainment like comics, television channels showing full day cartoons, video games but it’s not the scenario in the rural areas. Children in rural areas have fun in playing healthy village games which makes children stronger and may be this only makes children stronger psychologically too in the future. Children of cities may get the mental or logical development but not the Emotional Intelligence which is much required than the Intelligence Quotient. Emotional Intelligence is the attitude shown by any individual when they come across tough situations in life; research has shown it can be developed by involving ourselves in the group games, living together in big joint families, learning to do different things and enjoy the fruits of labor. Intelligence Quotient or IQ as it is popularly known has gain significant importance over the last decade. IQ determines the brain’s capacity of a person. There are many tests which are used to measure IQ of a person but none of them proved to be unique to determine it. Many claim that there are medicines, techniques and tools to develop IQ but none of them are proved to be authentic. On the other end children of rural areas are not getting good education, access to resources, what can be done further to improve themselves through education etc., These are just the indicative problems, list is endless. By popularizing group games in the city children, we can improve situations much better. Village children will get love, care and facts of real life as there are no electronic gadgets or divided family systems. They are much exposed to life and dream of having better future rather than creating hypothetical world around them. Village children must be given access to resources and opportunities to nurture the talents among the rural kids. Schools which are taking donations and fee in 5 or 6 digit numbers should also look at developing moral values and emotional intelligence in the kids rather than making schools as just commercial factories which will have only buyer-seller relationship. Role of parents is also important in this matter, so a balanced approach will keep children happier. After all whatever parents do is for the betterment of their children’s life itself and nothing else! The main attraction of spring season is the leafless trees which shed their leaves to have all new green growth. Apart from this another attraction is the flowers of Mango tree which starts to bud in this season and slowly starts to grow up tender mango’s which are soar to taste and gives an immense pleasure in eating them. We being kids of around eight to ten years old used to have fun in eating them without the notice of parents! Those days are awesome golden days, used to eat tender mangoes stealing from the neighbor gardens without the notice of gardener or the worker of it. Before going to garden in a group of 5 or 6, making arrangements to take off the mango and eat it. One used to bring salt, other chilli powder which tastes best than anything with mango and it’s not comparable to anything. This is story of eating in Gardens. Road side Mango trees also used to have fruits of spring, we being taking the contract of those trees on our own used to guard them from morning to evening thinking some other people may take the charge of those trees. One fine day without notice of parents as I told before used to bring the usual ingredients to mix with the mango and eat. Like this I used to spend my vacation jovially and also making it a point to go to Grand mother’s place, to have fun. Gone are the these old days of happiness, now the children will have fun on electronic gadgets more than the other games and also trend is changed in the name of Summer Camp or Summer Schools. Even the road side trees are cut for the cause of widening of roads without even knowing the necessity of these, while travelling on those roads where the trees used to stand from may be more than hundred years are just added to the pages of the history. I just felt it’s the fall of roadside ‘Mango’ism. World cup fever has slowly started to subside. Getting world cup after twenty eight years is a sensation of joy, proudness and a dream come true situation of many years. Thanks to all the players who made us proud by taking the Word Cup. May this is the last world cup of Master Blaster Sachin Tendulkar, as Dhoni added to this as he is dedicating this world cup to Sachin. But one thing saddened me is are we giving too much importance to the cricket players neglecting all other sports players of be Hockey, Weight lifting or Athletics. After knowing the bumper bonanza announced by BCCI and the central minister for railways for the cricket players the thought came to my mind is why I didn’t become cricket player!! BCCI has announced cash prize of rupees one crore to each player, apart from all the benefits they get from ICCI along with the trophy. This may be equivalent or more than the amount which BCCI offered. As the Srilankan team being runner up in the World Cup, ICCI offered rupees seven crore as prize to the entire team. Union Railways Minister of India announced free travel to these players for life time in the A. C. coach (Thank god as there is no instance of Cricket players travelling by train even by mistake). Chief Minister’s of one or two state have offered to give land to the players in their state remembering this memorable occasion. Basically Indian cricket players are on the top in getting highest revenue from the advertising companies may be in few days most of the players will tie up with the advertising companies for a bigger deal as we are World Cup Champions. Indian Cricket players will have handsome income this time which can be only calculated in crores or millions! This is the story of world cup players. Do these Advertising companies, Central Government and State Government provides so many facilities to the medal winners of Olympic, Asian or Common Wealth Games? I am not able to recollect any one announcing offers neither the Governments nor the Advertising companies. Those who have won medals in the games are finding it difficult to get jobs and no facilities at all to practice. In Asian, Common Wealth or Olympic games you won’t find the same players in the subsequent games. Clarification may be good performers will be sent to games but the truth is those who have gone once and won medals are not getting any facilities to either practice for games or offers of job and similar facilities. They are the people who also make India proud but we don’t have remembrance of their achievement. By this we can clearly make out we are neglecting all games except Cricket. National game of India Hockey is also slowly shading away from the memories of younger generation. Athletics have no value at all in front of cricket. Earlier small children used to play any village games but now everywhere cricket fever. If proper prominence is not given to other games, days are not so far where we can read about other games in the pages of history! Do you want to know how to lead a happy life as long as you can? Do you think Cholesterol produced by body is the main reason for all the diseases? If it is not good for health why the body produces cholesterol? Taking tablets daily for different ailments really has meaning? Is it the physical food we eat is the reason for all kind of diseases? Does continuous exposure to sun light causes cancer in human skin? Whether modern hi-tech hospitals are really important for making people healthy? To know about all these things you must read a book ‘You can be Healthy’ by Dr. B. M. Hegde. Dr Hegde clearly tells how disease mongering is done by the pharmaceutical industries to create fear among people and sell their products. It is creating false knowledge and belief that taking drugs will keep the diseases away but it’s not the truth. Another much debated topic is production of cholesterol by the human body. If human body is not benefitted by cholesterol then why human body is producing cholesterol? The interesting debate goes on. Diseases like cancer, ulcer or any other ailments are caused by the food what we eat, it is not the rice, wheat or ragi we eat, but it’s the egoism, jealously, selfishness are the real culprits causing cancers. Also Dr Hegde suggests people to have heart transplant it’s not the one done at Hi-Tech hospitals, but it’s the one to have sympathy towards people and let’s make the life of other people on the earth happier. It can also serve people as Health Wisdom Guide and good book to have in your collection. On a personal note Dr B M Hegde is an internationally renowned cardiologist, being retired as Vice Chancellor of Manipal University heading Bihar State Health Department Association. Dr Hegde is recipient of numerous awards, honors including Padma award from Government of India, he continuously educate people through All India Radio and Doordarshan. He is probably the only Indian to work as an examiner at the Royal Colleges of England which is rare to attain that eminence. Last one decade had brought lot of revolution in the life style of people; mainly advent of internet has changed the outlook of life. 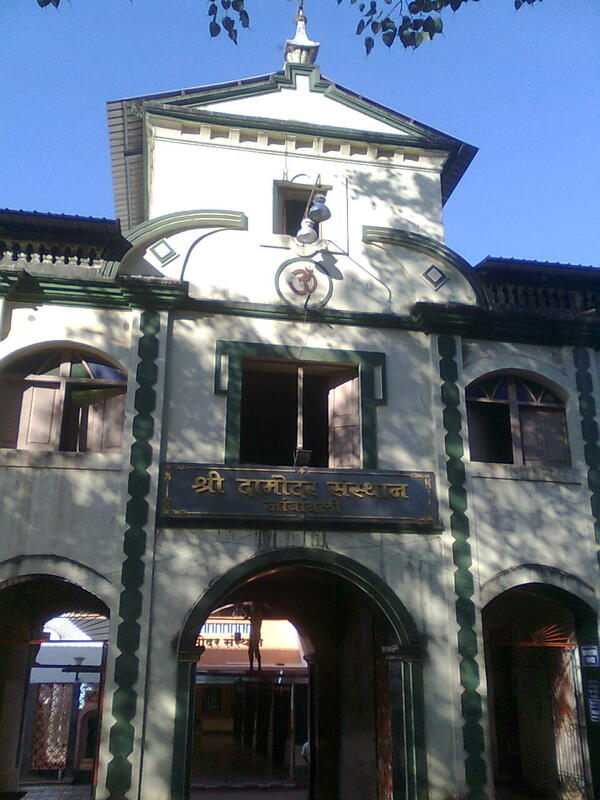 In general the mode of communication, collection of information (through search engines), reservation of tickets in trains, buses and flights, recharging of mobile phone and DTH currency, booking of hotels, paying utility bills, applying to various jobs and even admission procedures of educational institutions has undergone drastic changes. Everywhere everything has become online. Time is not so far where anyone wants to be a part of one or other online communities or social networking sites. A best example is the revolution caused by Facebook, Orkut and Twitter. Twitter has become so popular that all celebrities leave a Twitter message or update than a press meet as it is the best way to reach people. E-Commerce in simple can be described as ‘Commerce aspects associated with Electronic Media or Technology’. In earlier days if you want to buy or sell any product you were supposed to go to market, describe your product, wait till any customer turns up and if customer turns up and if customer is satisfied by your product he or she will purchase after substantial amount of bargaining. But now technology has advanced the life, as in market you can buy or sell anything through internet. Even banking transaction on internet has become so simple that people avoid going to conventional banks and procedures. You may be astonished to know many of the Online Shopping centers operate from a small room rather than any big buildings! As a revolution of E-Commerce you can buy or purchase anything with a few mouse clicks. Big Bazaar, one of the leading retail chains of India has started retail trading of products online so that you can buy any of your household needs of day to day life. You can now also purchase Mobile Phones, Books, and DVDs online and can be shipped to your address. An attracting feature of online book store is it provides much better discounts than any book store as there is no infrastructure cost involved with it, even if it is involved that is very negligible. Online shopping marts provides much better discounts and flexibility in choosing what you want just by searching in the mart or store website(which is far better than searching for a simple object in the entire store building). Payment methods are also made simple; at the end of shopping you can pay your bills through Debit card, Credit card, Internet Banking using standard Payment Gateways such as CCAvenue or PayPal. Now some of online stores have provided an option to pay Cash On Delivery (C. O. D.) of products. E-Commerce was thought 'Not for me' few years ago but it has become 'Now for me'. The book is simply superb. The way book is written will effortlessly take you from first page to last page. This book is a must read for those who want to be successful entrepreneurs, who want to grow overcoming challenges faced, using SWOT(Strength, Weakness, Opportunities, Threats) analysis technique to make a difference from other competitors. Being conned by his own brother, with an huge overhead of credits Mr. V. V. Kamat started all alone from scratch building Orchid group of hotels, which own the prestigious global awards for its eco-friendliness. It is one of the India's first fully Eco-Tel hotel aimed at minimizing the risk to nature. I finish off this write up just by narrating one of the incidents how entrepreneurs should look at business and grow up using new ideas and techniques. One of restaurant of Kamat group was established on the highway side, the main challenge was to attract customers. To attract customers Mr Kamat used a simple technique and placed a mirror in the Ladies wash room so that the customers who comes to wash room will make up themselves and stay there for quite long time and also they like to come the next time while travelling via that route, this may look simple and filmy idea but it works out well as it’s a way to attract customers. I can challenge you can’t stop yourself laughing while reading some chapters in the book and also moistening your eyes in some chapters!